Spanish painter Joaquín Sorolla y Bastida excelled in landscapes, huge works with historical and social themes and portraits. His works were noted for his skillful presentation of landscape and people under the warm and bright sunlight of Spain. Joaquín Sorolla was born on February 27, 1863 in Valencia. He was the eldest of two children. His parents died when he was just over two years old and he and his sister were raised by their aunt and uncle on their mother’s side. The first painting he had major success with was “Otra Margarita” (Another Marguerite) that he painted in 1892. It was a gold medal recipient at the National Exhibition in Madrid. It also won the first prize when it was included in the Chicago International Exhibition. The painting was acquired and later presented to the Washington University Museum in Missouri. This solidified Sorolla’s reputation, leading to the appointment as head of the modern Spanish school of painting in his homeland. In 1894, his “Return from Fishing” was well received at the Paris Salon. It was bought by the French government specifically for the Musée du Luxembourg. In 1897 Sorolla painted two outstanding works, “A Research” and “Portrait of Dr. Simarro at the Microscope.” Unveiled Madrid’s National Exhibition of Fine Arts in the same year, these two paintings gave the artist the Prize of Honor. 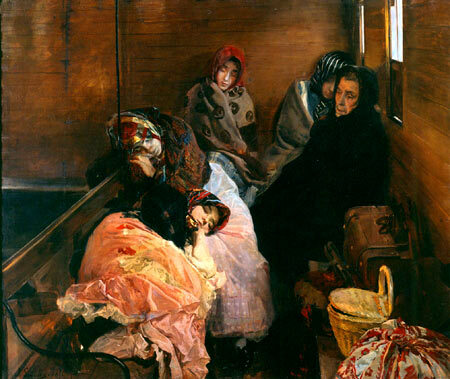 Sorolla’s career had a greater turning point in 1899 when he presented the “Sad Inheritance” to the public. It depicted several crippled children supervised by a monk as they bathed in the sea. It was such an evocative painting, which gave Sorolla the highest official recognition, a Grand Prix at the Universal Exhibition in Paris in 1900. Sorolla showed heightened interest in the deft handling of the medium as well as shimmering light through the series of oil sketches he did for “Sad Inheritance.” They were quite good pieces already and he gave them as gifts to his artist friends, William Merritt Chase and John Singer Sargent. It was the first and last time that Sorolla painted something that had such an open social consciousness theme. The artist received more recognition and awards. He became a member of the Fine Art Academies not only in Paris but also in Valencia and Lisbon. He was also named as Valencia’s Favorite Son. Sorolla was appointed as Officer of the Legion of Honor in 1906 after the special exhibition of close to 500 of his works in 1906 at the Galeries Georges Petit. He also held exhibitions in London and Germany. He was made a member of the Hispanic Society of America (New York City) by Archer Milton Huntington, who invited Sorolla to have an exhibit in New York in 1909. Although he did not put too much emphasis on portraiture, Sorolla did several portraits of his family as well as some noteworthy people. While in America he did the “Portrait of Mr.Taft, President of the United States” (1909). His portraits showed some influence from Diego Velázquez and at times showed his desire to compete with his friend, John Singer Sargent, like in the “Portrait of Mrs. Ira Nelson Morris and her Children” that he did in 1911. Sorolla also did the “Portrait of King Alfonso XIII in a Hussar’s Uniform” in 1907 and “Portrait of Mr. Louis Comfort Tiffany” in 1911. Joaquín Sorolla was able to marry en plein air painting with portraiture, producing canvases that showed his subjects outdoors in landscapes that were bathed in sunlight. The artist received a commission from Huntington to create a series of oil paintings depicting life in Spain. He created 14 large paintings for a period of seven years, from 1912 to 1919. Instead of showing the history of Spain in the murals, Sorolla opted to show the different regions of Spain, traveling to the specific locations to paint en plein air, with the models wearing local costumes. The paintings are still installed in the building of the Hispanic Society of America in Manhattan. 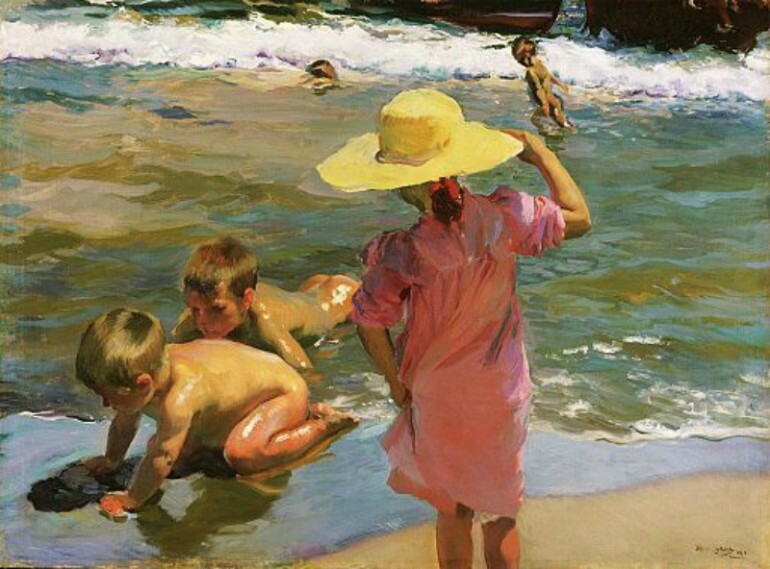 Many though that Sorolla was an Impressionist because of the way he worked. But his style was truly his own. He painted quickly, but was able to show the details he needed for his theme. Most of his later works showed his fondness for the bright sun of Valencia, showing fantastic brilliance and great contrasts. He mastered the use of color for dramatic effects. His favorite themes depicted ordinary people going about their daily lives with such realism, often showing children and adults enjoying the beauty of nature.